The problem with much of the debate about North East IPAs is that we're stuck on a path that is beset with generalities. One tweet, at the very beginning, didn't name the brewer or the beer, and so we've been forced to talk about the general value of hazy grassy fruit juice IPAs from the North East. That means lots of yelling. One side is stupid because they don't understand what could be wrong under the hood. The other side is stupid because the beers taste good, silly. We don't even know what beers or why. There are plenty of opinion pieces on this site. That's fine, opinion has its place in beer writing, no matter how nerdy you get. But this is also a site that attempts to answer questions using data. And if we are to attack the issue at hand -- that some of the old guard thinks that the NE IPAs are turbid and yeasty, while the new guard thinks they are being too style-specific and not giving credit to innovation -- then we need to create a framework for that discussion. If we are going to discuss the source of the look and taste of the North East IPA, then we need to focus on three sources of 'haze' and 'turbidity' in beer. 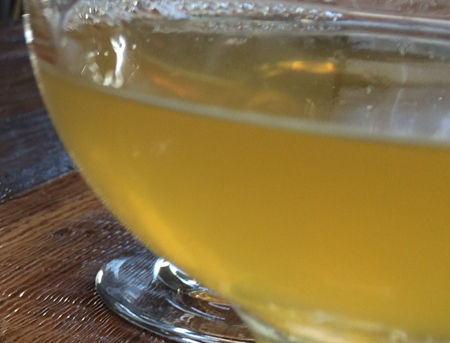 It's not the dry hopping itself, or hop particles, that can make a beer hazy. It's a reaction between the post-boil hops and the beer that creates polyphenols. These particulates are created in the interaction between water and plant matter, but normally the boil clears them out. When you dry hop, you introduce that plant matter without the clarifying effect of the boil. So you get a hazy beer. It can possibly be attacked by manipulating the acidity of your beer, and maybe using some biofine again as a post-boil fining agent, but this seems largely unavoidable and maybe not that big a deal. Here's the big one, because the line between 'haze' and 'turbidity' seems to be the level of yeast in the beer. Normally, filtering with either Isinglass (a compound derived from fish bladders) or a more modern synthetic version should rid your beer of excess yeast. The general industry consensus is that yeasty flavors are bad for IPAs, but that may be changing. This was the idea we got at with the post looking into adding flour to IPAs to create a hazy look. Flaked oats can also give your beer a hazy look... if you don't run the beer through any sort of whirlpool or centrifuge to filter it. Most brewers do. Apparently not all brewers do, but there are too many clear looking beers out there with flaked oats on the bill to call this the source of most of the haze in New England. With these three aspects of beer making in front of us, it becomes a question of measurement. You can measure yeast concentration or density, starch concentration, and track dry-hopping as a source and gather filtering information. You can start to discuss actual real-life beers in order to talk about specifics. For example. We tested Fieldwork's "Pulp-Free" and Tree House's "Alter Ego" for yeast. Fieldwork's beer is a little less hazy -- take a look below -- but it's considered one of their hazier beers. It had 25 yeast cells per .0025 millimeter squared. Alter Ego is pictured in the header next to Fieldworks' Morado Punch. It has 1325 yeast cells per .0025 millimeter squared. That's a huge difference. Maybe it won't matter to many. We certainly aren't going to argue you out of liking one or both of these beers. This beer drinker loves both beers and though the Morado and Pulp Free are 'brighter,' there's a lot of class in all three glasses. I love em both. But! Testing more beers will allow us to be more precise about what we are talking about. It will allow reviewers and and pontificators to delineate classes. These yeast-heavy beers are turbid and I don't like them. These hazy beers are brighter, more classic beers. These unfiltered beers are merely starch-heavy. These beers -- like, perhaps a Cellarmaker -- have had the crap dry-hopped out of them and are merely hop-hazy despite massive attempts at filtering. In any case, that sort of conversation would be more precise. And so, for any brewers reading this, please email eno at beergraphs dot com to receive a completely confidential survey that will help us better know our beers. And for any beer drinkers reading this, please send us your local hazy North East IPA -- and maybe even Hoof Hearted from Ohio -- for testing.